Our GuestCall IQ® pager is a compact and powerful paging solution for guest waitlist management. With a brandable front display insert you can easily promote your businesses' services. Also, with the unique system ID there is not interference and up to 2 miles of coverage. 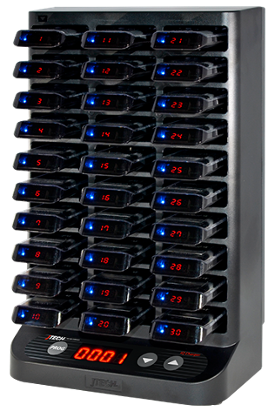 The IQ 30-slot charging tower not only saves you space, but also renumbers all of your pagers automatically. 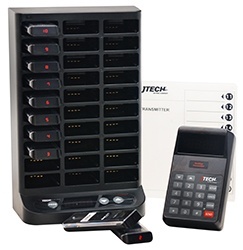 It's never been easier to program, stock and reorder guest pagers. The smart charging technology charges pagers in 4 hours without overcharging — saving the battery life of your pagers. This paging system comes with the best-selling Neo Guest Transmitter which is perfect for restaurants and businesses that need a simple, fast and reliable solution. Need more than 30 pagers? Need a custom pager package? Our paging systems are flexible. Contact our experts to find out which solution is best for you! 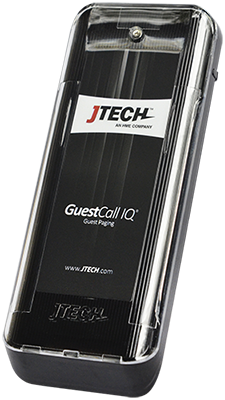 The GuestCall® IQ is high-quality, long-range guest pager with a place to display your business card or ad front and center. The Neo Guest Transmitter is built from high-quality materials and has coverage for up to 2 miles. The GuestCall IQ Charger holds up to 30 IQ pagers and charges them fast. Your GuestCall IQ® pager package includes everything you need to get going today! From transmitters to pagers, JTECH's quality is second to none.